Maria Spelterini was the first female to cross Niagara Gorge on a highwire (1876)! If you have ever been to Niagara Falls you know how amazing that is, just standing near those enormous waterfalls freaks me out. She performed this feat several times blindfolded and with her wrists bound and another time with peach baskets strapped to her feet (forget crocs, pass the peach baskets please!). We love the idea of fearless female daredevils and are sure there are quite a few of you out there reading this now. Ms.Maria would have been an awesome Gloomth-Girl, look at that wicked hairstyle! 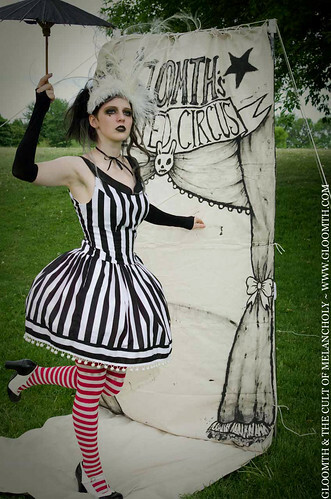 In honour of this amazing woman we have named a design after her in the new Gloomth’s Haunted Circus line! Our “Spelterini” Dress is the perfect summer frock for your death-defying highwire performances or for that garden party where you need to look extra-fierce. Trimmed in gold-flecked white pompoms it has all the feel of our vintage circus range! This dress also looks great worn without a petticoat for a more casual feel.